John Hodgman-bestselling author, "The Daily Show"'s "Resident Expert," minor television celebrity, and deranged millionaire-brings us the third and final installment in his trilogy of Complete World Knowledge. In 2005, Dutton published "The Areas of My Expertise," a handy little book of Complete World Knowledge, marked by the distinction that all of the fascinating trivia and amazing true facts were completely made up by its author, John Hodgman. At the time, Hodgman was merely a former literary agent and occasional scribbler of fake trivia. In short: a nobody. And so he returned, crashing his Kansas farmhouse down upon the wicked witch of ignorance with "More Information Than You Require," a "New York Times" bestseller containing even more mesmerizing and essential fake trivia, including seven hundred mole-man names (and their occupations). 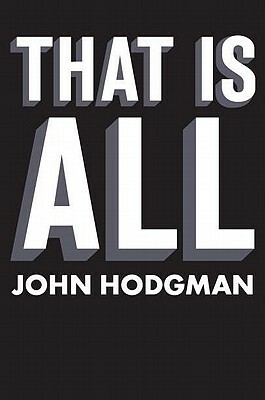 And now, John Hodgman completes his vision with "That Is All," the last book in a trilogy of Complete World Knowledge. Like its predecessors, "That Is All" compiles incredibly handy made-up facts into brief articles, overlong lists, and beguiling narratives on new and familiar themes. It picks up exactly where "More Information" left off-specifically, at page 596-and finally completes COMPLETE WORLD KNOWLEDGE, just in time for the return of Quetzalcoatl and the end of human history in 2012.